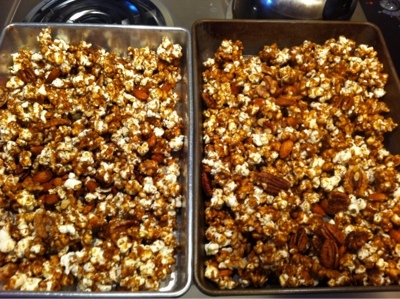 If you are like me, you already have a hard enough time eating a reasonable amount of ordinary popcorn ... but if you want true "popcorn crack," coat it in caramel, add nuts, and bake it! Mmmmmm. Hardest part will be making sure we have some left to take with us to the Halloween party tonight!